NORWICH CITY have rejected a £5m opening offer for Alex Pritchard from Huddersfield Town. The bid for the 24-year-old midfielder was swiftly knocked back by City’s sporting director Stuart Webber, who has already made it clear that head coach Daniel Farke is under no pressure to offload his best talent in the coming weeks. Town head coach David Wagner revealed late last week that he is a big admirer of the former Tottenham prospect, but Town’s initial move has come to nothing. Speaking about the Pritchard interest after Norwich’s FA Cup draw with Chelsea, Farke said: “I am not involved in whether Huddersfield are interested in him or not. “All I can say he is so important for us and how we play. The board and Stuart Webber made it clear there is no financial pressure to sell him in this window. Wanted: Ryan Kent is wanted back at Barnsley. Leeds United are closing in on the signing of Club Brugge left-back Laurens De Bock after the defender quit the Belgian side’s training camp to tie up a move. De Bock left Brugge’s winter base in Spain on Monday morning with a transfer to Elland Road edging nearer after prolonged talks over a switch. The 25-year-old is likely to undergo a medical with Leeds in the next 48 hours and should conclude his transfer ahead of United’s game with Ipswich Town at Portman Road this weekend. Japanese international midfielder Yosuke Ideguchi was unveiled as a Leeds player today after arriving in England to undergo a medical ahead of a £500,000 move. Alex Pritchard: Target of Huddersfield Town. Ideguchi is set to be loaned out to Spanish side Cultural Leonesa to the end of the season, following completion of his move. Sheffield United and Barnsley are among several Championship clubs in the market for Liverpool winger Ryan Kent, now likely to head out to a second-tier side for the remainder of the campaign after his loan spell at Freiburg was cut short. The 21-year-old impressed in a loan spell at Oakwell last term, with the Reds keen on bringing him back. 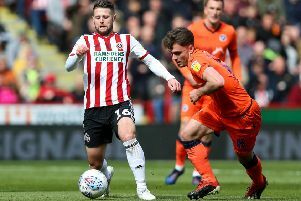 But the Blades, also targetting Manchester United striker James Wilson and Wolves midfielder Lee Evans, and Bristol City are also in the hunt. Barnsley are also in the market to sign Oxford United custodian Jake Eastwood. Middlesbrough are keen on Aston Villa’s experienced right-back Alan Hutton. Boro are likely to be short of cover on the right-hand side of their defence shortly, with Connor Roberts having returned to parent club Swansea and Fabio keen to leave.